Vee Double Moo’s menu responds to the seasons…with churros! An ice cream business from Bedminster, Bristol has found an ingenious and delicious way to extend their menu for the autumn and winter months. Vee Double Moo has been selling delicious softserve ice cream, sundaes and dairy-free options at Brandon Hill Park since July. Owner Bridget Pilkington loves trading at the pitch and so is reluctant to pack up for the winter – “I have done homemade hot chocolate, cupcakes and chocolate dipped pretzels at Christmas fairs for a couple of years but I wanted to find something different to add to Daisy the Van’s repertoire”. Bridget used her foodie contacts and having met with Churros Garcia is now proud to serve steaming hot churros with hot dipping chocolate. Churros Garcia have been serving the festival and London market scene for a long time and owner Lesley is (at least!) a second generation churros maker. The Spanish doughnuts are now served by Vee Double Moo with original Spanish Valor chocolate, with or without cinnamon. She goes on to say “It is a slight departure from the dairy nature of Moo’s usual menu but the hot dipping chocolate relies on good quality organic milk, and churros compliment all the other frozen treats and hot drinks on offer from the van”. 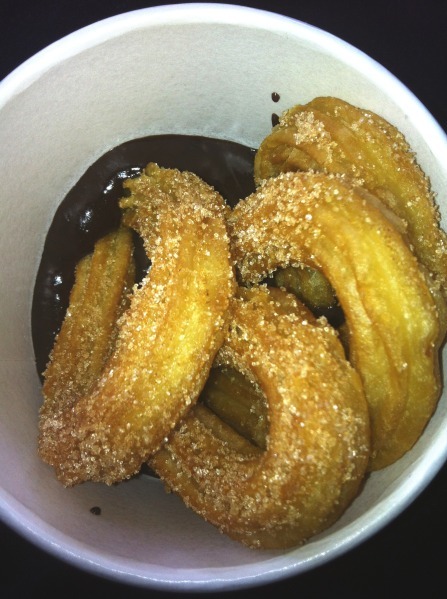 Watch this space for more interesting churros developments at Moo HQ! For more information on Vee Double Moo see @VeeDoubleMoo or visit www.veedoublemoo.co.uk.